H.G. 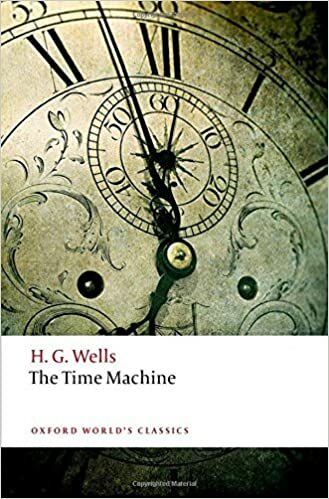 Wells’ THE TIME MACHINE is one of the foundational science fiction novels. Published in 1895, it was Wells’ first novel, though it’s short enough that later anthologists have reprinted it as a novella (e.g. in the second volume of THE SCIENCE FICTION HALL OF FAME). But compilers of reference books and reading guides overwhelmingly consider it a novel, if only because it’s been published as an independent book so many times over the past years. It’s one of the earliest SF novels I read, in part because the 1960 film version, by George Pal, was one of the earliest SF movies I saw — in late 1966, I think, when I was in the 7th grade. (The junior high school I was attending showed the film in 15 or 20 minute increments during lunch breaks, and I missed the first couple installments at the time, not seeing the entire film until years later.) I just watched the film again, a couple months ago, and so picked up the novel one more time. I read it every decade or so, because it’s short, evocative, and I need to keep it clear in my mind against the memory of the film. I shouldn’t need to summarize the novel for anyone reading this blog, but the bare bones are worth repeating: a lone genius gentleman in 1895 expounds to his friends about the fourth dimension; he’s taken 2 years to build a machine to travel through time; and when he uses it, he travels to the far future, to the year 802,701 AD, where he finds a social order split into passive Eloi and monstrous Morlocks, in a reflection of the social trends the author perceived when he wrote. The Time Traveler (he is never named) escapes the Morlocks and travels even further into the future, arriving on a cold beach where a dying sun shines on monstrous crabs, and then even further to when an eclipse masks the sun and leaves the world in total darkness, before returning to his present and telling his story. And then departs again, leaving fragmentary flowers. “One cannot choose but wonder,” concludes the narrator. This time I summarized the ways in which the book and film are different. The movie has the TT destroy the underground lair of the Morlocks — as if this one area is the whole world — because, in Hollywood, the good guys must defeat the villains, not merely escape them. As the TT leaves again at the end, he takes three books with him. In this novel Wells can be fairly said to have invented the idea of time travel, an idea that would be endlessly explored by later science fiction writers. Curiously, in the introduction Wells mentions one implication of time travel — the idea of compounding interest — which the film omits. Strength is the outcome of need: security sets a premium on feebleness. This work of ameliorating the conditions of life–the true civilizing process that makes life more and more secure–had gone steadily into climax. One triumph of a united humanity over Nature had followed another. What, unless biological science is a mass of errors, is the cause of human intelligence and vigour? Hardship and freedom: conditions under which the active, strong, and subtle survive and weaker go to the wall; conditions that put a premium upon the loyal alliance of capable men, upon self-restraint, patience, and decision. And the institution of the family, and the emotions that arise therein, the fierce jealously, the tenderness for offspring, parental self-devotion, all found their justification and support in the imminent dangers of the young. Now, where are these imminent dangers? There is a sentiment arising, and it will grow, against connubial jealousy, against fierce maternity, against passion of all sorts; unnecessary things now, and things that make us uncomfortable, savage survivals, discords in a refined and pleasant life. Under the new conditions of perfect comfort and security, that restless energy, that with us is strength, would become weakness. Even in our own time certain tendencies and desires, once necessary to survival, are a constant source of failure. Physical courage and the love of battle, for instance, are of no great help–may even be hindrances–to a civilized man. And so Steven Pinker has described how the reduction of violence over the past few centuries has been the dismissal of ‘honor culture’ that glorifies personal valor at the cost of killing others. A curious trade-off, which Wells’ novel might be seen as exploring the consequences of. This entry was posted in Book Notes, science fiction. Bookmark the permalink.